Fast cats love the cold… The Jaguar XKR-S Convertible 2012 is the most powerful and fastest open-topped GT Jaguar has ever built. 580PS; 680Nm; 0-60mph in 4.2 seconds; top speed 186mph. 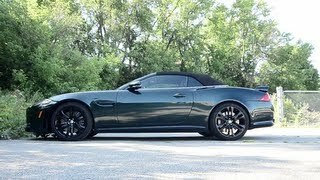 These are just a few of the XKR-S convertible's vital statistics. Powered by the most advanced version of Jaguar's supercharged 5.0-litre V8 engine, it's the most potent drop-top Jaguar has ever built and was devised with the intent of providing its driver with as much roof-down reward on the track as it delivers on the road - a goal achieved with ease courtesy of its inherently rigid all-aluminium construction. Supercharged AJ-V8 GENIII petrol engine produces 550PS (405kW) and 502lb/ft (680Nm) but just 292g/km of CO2. Top speed 186mph (300km/h) and 0-60mph in 4.2 seconds (0-100km/h in 4.4 seconds). New sills smooth the horizontal airflow and emphasise the 10mm reduction in ride height. The XKR-S Convertible takes the raft of performance, dynamics, design and interior upgrades already introduced to much acclaim on its coupe sibling to create Jaguar's fastest ever open-topped GT. The building block for the car's explosive performance is an uprated version of the 5.0-litre supercharged AJ-V8 engine, which produces 550PS (405kW) and 502lb/ft (680Nm) of torque. These figures represent a power increase of 8 percent and torque increase of 9 percent over the Jaguar XKR. Driving the rear wheels through a six-speed automatic gearbox with Active Differential, this propels the XKR-S Convertible to 60mph in 4.2 seconds (0-100km/h in4.4 seconds) and on to an electronically limited top speed of 186mph (300km/h). Underpinning this potent performance is a comprehensive package of suspension upgrades which refine the XK's dynamic abilities still further, creating an intimate connection between the car, the driver and the road, enhanced still further in this open-topped GT. The lightweight aluminium structure of the XK has huge torsional rigidity, allowing the fitment of suspension components such as a redesigned aluminium front steering knuckle and revised rear geometry, stiffer springs and dampers. Allied to lightweight forged wheels and recalibrated steering settings this has allowed Jaguar's vehicle dynamics experts to create a supremely agile, connected driving experience with no loss in refinement. The exterior changes are highlighted by the application of gloss black to the exterior brightwork, complemented by the dark technical finish of the lightweight, forged 20" Vulcan design alloy wheels through which can be seen the Jaguar High Performance Brake calipers finished in either an eye-catching red or discreet gunmetal. The XKR-S Convertible is available in a range of six colours, including Polaris White and British Racing Green, a tribute to Jaguar's competition heritage. The acoustically treated hood opens and stows in just 18 seconds and has been proven at the car's maximum speed. It comes in black as standard with a further six optional colours available. 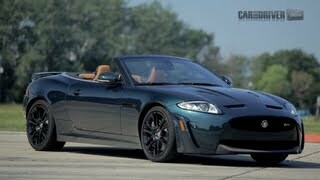 "Taking the track-oriented ethos of the XKR-S Coupe and applying it to a convertible is very exciting. There is a real spirit and thrill to driving with the roof down and in a car capable of these speeds that is going to be exaggerated to create a very dramatic and special experience." Jaguar pioneered the use of aluminium in series production cars and it is this metal's low mass and high tensile strength that gives the XKR-S such a breadth of abilities. A kerb weight of 1795kg and torsional rigidity of 16,500Newton metres per degree provide Jaguar's engineers a solid foundation on which to apply the detail changes that create the company's most involving convertible ever. The Jaguar High Performance Braking System fitted as standard is more than a match for the car's seductive performance. Huge brake discs - 380mm front and 376mm rear - in combination with aluminium calipers and pad areaincreases of 44 percent front and 31 percent rear in comparison to the XK provide confidence inspiring levels of power, stability and feel. 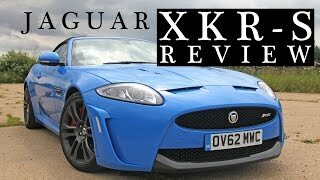 "Because the XK was designed as a convertible it has great structural integrity. This allowed us to apply the XKR-S coupe's sporting suspension settings to create a convertible with no compromises. Its blend of great speed, precision and dynamism is given an extra dimension with the roof down and that thrilling exhaust soundtrack." Exclusive to the XKR-S models are carbon-leather trimmed versions of Jaguar's Performance seats which feature integrated head rests, racing harness cut-outs and increased side and squab support to hold driver and passenger securely during high speed cornering. The 16-way adjustable, heated seats feature highlights of carbon leather and contrast micropiping unique to the model.